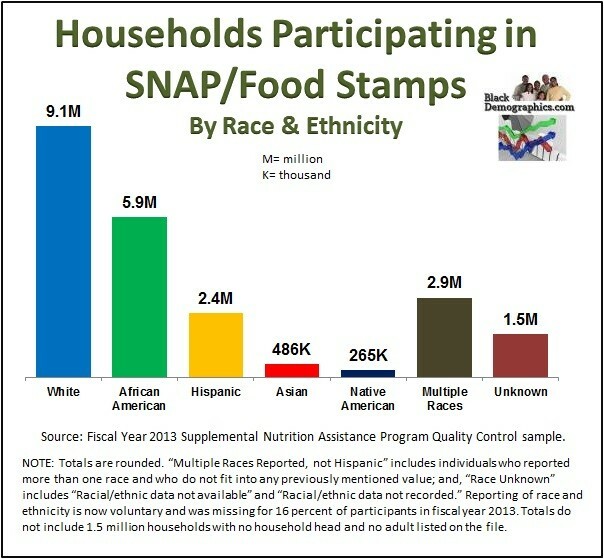 According to the 2014 U.S. Census Bureau ACS study (see charts below) 27% of all African American men, women and children live below the poverty level compared to just 11% of all Americans. An even higher percentage (38%) of Black children live in poverty compared to 22% of all children in America. The poverty rate for working-age Black women (26%) which consists of women ages 18 to 64 is higher than that of working-age Black men (21%). Poverty rates for Black families vary based on the family type. While 23% of all Black families live below the poverty level only 8% of Black married couple families live in poverty which is considerably lower than the 37% of Black families headed by single women who live below the poverty line. The highest poverty rates (46%) are for Black families with children which are headed by single Black women. This is significant considering more than half (55%) of all Black families with children are headed by single women. The U.S. Census Bureau records historical poverty data among American families using its Current Population Survey and Annual Social and Economic Supplements (chart below). In 1967 about one third (33.9%) of all Black families lived below the poverty level compared to only 11% of all families in America . By 1990 the disparity gap between the two remained virtually the same despite a slight decrease in the overall poverty rate for both population groups. During the decade of the 1990s while the nation was experiencing an economic boom the poverty rate of Black families dropped from 29% in 1990 to 19% in 2000 virtually cutting the disparity in half. The economic downturn in the decade from 2000 to 2010 caused the increase of the Black family poverty rate to 24%. Since 2010 the Black family poverty rate began to decrease sightly reaching 23% in 2014, however the disparity has remained relatively unchanged since 2000. In 1967 more than a half (56%) of Black families headed by single women lived below the national poverty level compared to 33% of all families in America headed by single women. During the decade of the 1990s the poverty rate of families headed by Black single mothers dropped from 48% in 1990 to its lowest point (34%) in 2000. The economic downturn in the decade from 2000 to 2010 increased the Black family poverty rate to 39% by 2010. Since 2010 the Black family poverty rate decreased sightly to 37% by 2014. Although the actual disparity between Black single mother families and all single mother families has always been lower than that between all family types the adjustments (increases and decreases) in disparity over the decades have been fairly similar. 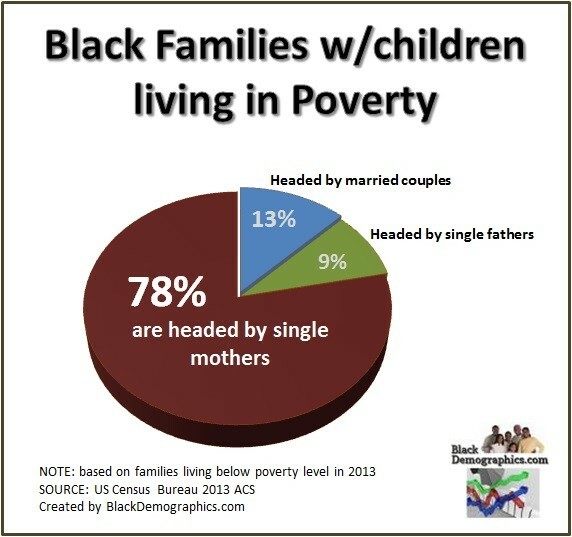 As the chart below shows when considering only Black families with children who live below the national poverty line the vast majority (78%) are headed by single women and just 13% are headed by a married-couple family. Only 9% are headed by a single father. The amount of African Americans who receive public assistance varies greatly depending on the type of assistance. According to the U.S. Census Bureau 14.5% of African Americans receive housing assistance including government housing or section 8 housing while 2.5% receive TANF cash assistance (formerly referred to as welfare checks). All of these statistics include those who receive benefits or those covered under the allotment of someone else’s benefits which does not always include everyone who lives in the household. The largest benefits received by African Americans include the 29% receiving Medicaid health insurance and 30% of African Americans who receive SNAP benefits (Food Stamps). 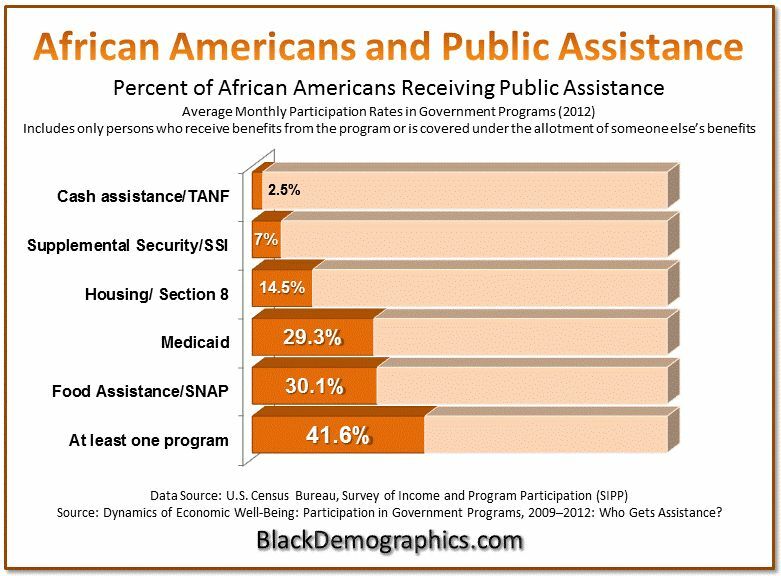 About 42% of African Americans (largely children) received some sort of public assistance.